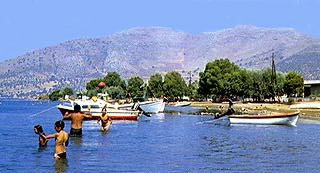 The island is the second largest in Greece, after Crete. Long and narrow, it stretches over the Aegean Sea very close alongside the shores of Mainland Greece, separated from it by the Gulf of Euboea and the famous Evripos Straits. A main highway and ferry-boats from several terminals form the links with this island space which is a centre of attraction for those seeking natural beauty and scenic variety. There is something of interest to be seen at every turn in Euboea. Towns brisk with tourist traffic or peaceful villages, apparently forgotten by time. There are large fertile valleys and wooded mountainsides where mountain climbers can enjoy themselves as much as those opting, instead, for the attractions of the sea shores with their excellent sandy beaches, organized bathing facilities and charming secluded coves. Modern life thrives alongside splendidly preserved tradition. There are picturesque country fairs where genuine local customs survive. 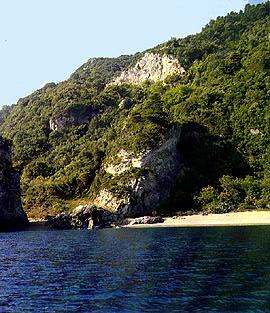 Euboea can promise and indeed offer its guests all this.